5 Bedroom Detached House For Sale in Middlesbrough for Asking Price £695,000. We are acting in the sale of the above property and have received an offer of 695,000 on the above property. With approximately 10 acres of grassland Oak House comprises of a substantial stone built detached former farmhouse complete with Acorn Lodge - a two bedroom cottage, suitable as guest, family or au pair accommodation. With grassland, a stable block, tack room, barn and an all-weather tennis court, all set in an elevated position with magnificent views over the surrounding dale and countryside. Acorn Lodge comprises of: Stone built, self contained cottage offering 2 bedroom, 1 bathroom and 1 shower room accommodation for guests. Grounds Comprise of: Stone flagged courtyard immediately to the East side of the property offering car standing space to the side of the house. Extensive stone paved terrace to the front of the house offering superb outside sitting, dining and barbecue area with views over the Dale. Lawned gardens to the side, rear and front of the main house offering a pleasant outside leisure and play area. Further extensive garden area to the side of the entrance driveway adjoining the Tennis Court. A hard surface all weather tennis court is situated to the South East side of the property. 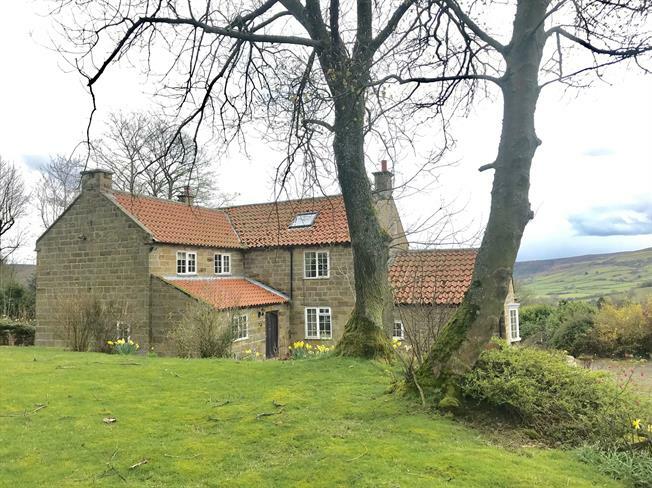 Situated to the rear of the farmhouse is a further block paved area with a substantial detached stone old building, formerly the village forge. The building still retains the original blacksmith's hearth and chimney. Electric light and power. A purpose built stable block constructed of stone with tiled roof has been constructed to the rear of the property and comprises 6 stables with concrete floor and electric light. There is a gate from the stable block to the adjoining field. The land is well situated around the house and comprises grass paddocks and small area of amenity woodland in a ring fence. The land is especially suitable for a purchaser with equestrian interests. Field Number: 3108 Grass 0.75 Ha/1.86 acres, 3707 Grass 0.36 Ha/0.90 acres, 4301 Grass 0.88Ha/ 2.18 acres, 3492 Grass 1.55Ha/ 3.82 acres, 2897 Grass 0.81Ha/2.00 acre, 3203 House & Buildings 0.53Ha/ 1.30 acres. Total 4.8Ha/ 12.06 acres. The sporting rights over the land are included in the sale. The property enjoys rights of way over and along the shared access roadway which also leads to Low Thornhill Farm.